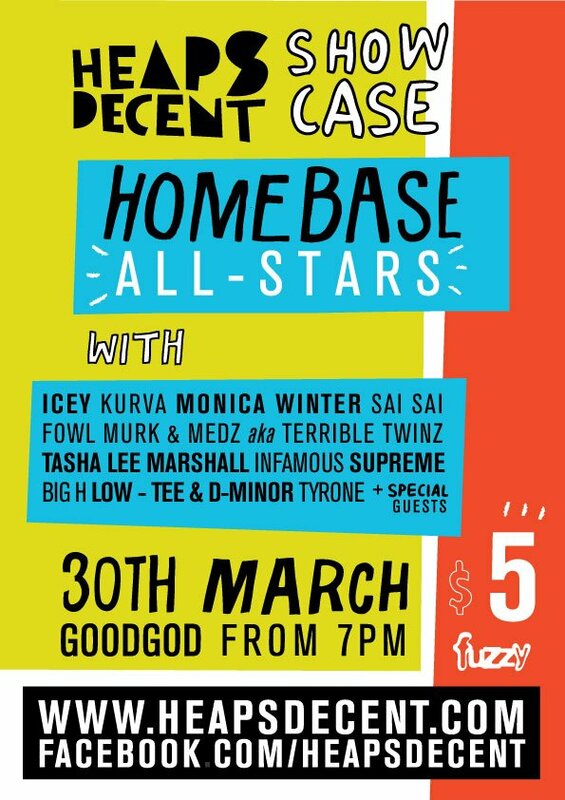 Heaps Decent | HEAPS DECENT SHOWCASE – THIS FRIDAY 30TH MARCH! HEAPS DECENT SHOWCASE – THIS FRIDAY 30TH MARCH! For almost a year now, Heaps Decent has been facilitating weekly music workshops for young people at Redfern Community Centre. The drop-in project is called Home Base and every Monday afternoon, anywhere between 5 and 30 young musicians write, collaborate and record their songs with a rotating roster of amazing Heaps Decent facilitators including Levins, Adam Bozzetto, Nina Las Vegas, Charlie Chux, Joyride, Toni Toni Lee, Kristy Lee, Shantan Wantan Ichiban, Melanie Otuhouma, Jeremy Pipemix, Hugh O’Brien, Pablo Calamari and Xavier Fijac. Throughout the year, the kids coming to Home Base have also had sessions with international artists touring Sydney including A-Trak, Jack Beats, Chris Devlin, Ghostdad, 12th Planet, Sinden, AC Slater and Maelstrom. We’ve been so lucky and grateful for all the generosity we’ve received. If you’re in Sydney this Friday 30th March, we’re holding a Showcase to give the guys that we work with each week an opportunity to perform their songs. It would mean a lot to everyone involved with Home Base and Heaps Decent if you could make it down to check out the fantastic work we’ve been doing. The Showcase goes down from 7pm to 9pm this Friday night at Goodgod Small Club, 55 Liverpool St Sydney and some of the kids will be performing their songs live! This will be the first performance for some of these guys and we’re hoping to have a room filled with friendly and supportive people. You can drop down after work and it finishes early! *The event is strictly OVER 18s, we’ll be doing another all-ages gig in the not-too-distant future.